Amniotic fluid embolism (AFE) is a rare but potentially lethal obstetric emergency affecting women during labor, delivery, or postpartum. Its classical manifestation is represented by a sudden, profound, and unexpected maternal collapse associated with hypotension, hypoxemia, and, less commonly, disseminated intravascular coagulation (DIC). A 33-year-old primigravida with a history of grown-up congenital heart disease (GUCH) presented to our hospital because of a spontaneous rupture of membranes at 31 weeks and 2 days. Her past medical history was remarkable for several surgical interventions related to the heart disease: an aortic coarctation correction when she was 19 months old, a surgical treatment of subaortic stenosis, and a mitral valve replacement with a St. Jude Medical valve (25 mm) with aortic valvuloplasty at 14 years old. The whole pregnancy presented no abnormalities except for the evidence at 30-week ultrasound of three placental lacunar vascular spaces. During hospitalization, she underwent serial ultrasound controls and when oligohydramnios was detected, a prompt cesarean section was performed. Despite the successful delivery, 2 h later, the patient presented a sudden and severe acute respiratory failure with peripheral cyanosis. Her physical examination revealed a reduction of vesicular murmur bilaterally, a blood pressure of 90/50 mmHg, and a heart rate of 116 beats/min. 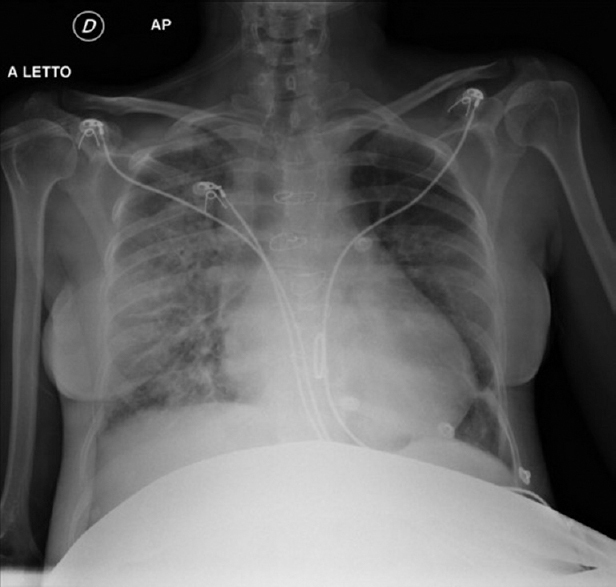 Arterial blood gas revealed a severe hypoxemia, and chest X-ray confirmed the presence of asymmetric lobar opacities [Figure 1]. The patient was immediately brought to our intensive care unit, where mechanical ventilation in continuous positive airway pressure mode was started at 5 L of oxygen per minute. Saturation mildly improved, but physical examination still revealed the presence of widespread fine crackles. Diuretic therapy with furosemide (0.25 mg/kg/h) associated with corticosteroids i.v. and a low dose of dobutamine (6 γ/kg/min) was started. Blood tests showed fibrinogen at upper limits (463 mg%; normal value 150–450 mg%) and elevated D-dimer (401 ng/mL; normal value = 0–200 ng/mL). A transthoracic echocardiogram (TTE) revealed a preserved left ventricular ejection fraction with a hypokinetic and mildly dilated [Figure 2]a and [Figure 2]b right ventricle (RV), a moderate tricuspid regurgitation with severe pulmonary hypertension, and a dilated inferior vena cava with no respiratory collapse. No McConnell's sign was detected. RV free-wall longitudinal strain obtained with the use of two-dimensional speckle tracking echocardiography and EchoPAC PC software (GE Medical Systems; Horten, Norway) was severely reduced: −6.2% [Figure 3]. The differential diagnosis was challenging: both pulmonary thrombotic embolism and acute respiratory distress syndrome (ARDS) were first of all evocated. 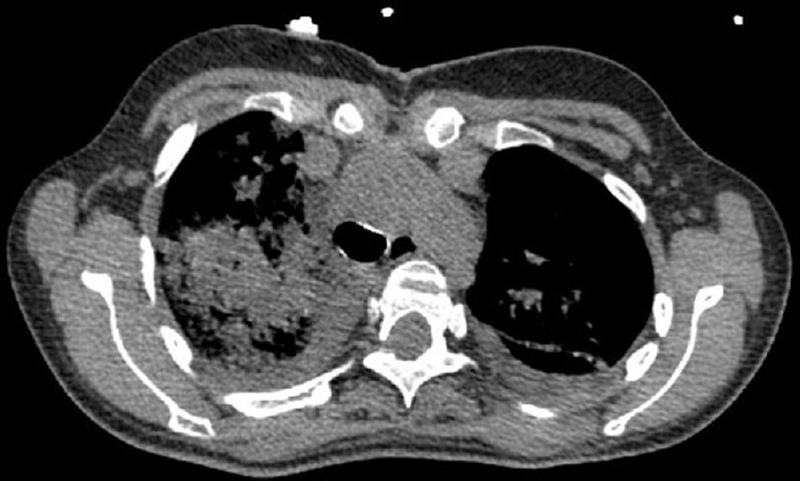 A computed tomography (CT) was performed showing the absence of pulmonary vessel occlusion with the presence of ground-glass opacities similar to the early stage of ARDS, with a prominent hilar pulmonary vasculature [Figure 4]. The evidence of pulmonary acute hypertension at echocardiography, however, led to exclude this syndrome. On the other hand, both preeclampsia and HELLP syndrome (hemolysis, elevated liver enzyme levels, and low platelet levels) syndrome could provoke an acute respiratory failure in peripartum period, but their characteristic bleeding problems and arterial hypertensive status were not detected in this case. Eventually, we made a diagnosis of AFE in this GUCH patient. At the end, a complete resolution of the acute respiratory failure was obtained. The patient was discharged from the hospital with the baby, 2 weeks postpartum. AFE is a devastating obstetric condition affecting women during labor, delivery, or also in the immediate postpartum period, when amniotic fluid, fetal cells, hair, or other debris could enter the maternal circulation. The pathogenesis of AFE is not completely clear: from its first description by Meyer in 1926 to date, several hypotheses have been postulated. First of all, an embolization of amniotic fluid that occludes the pulmonary vasculature. An alternative mechanism of a systemic inflammatory response to fetal antigens, potentially causing an inflammatory-mediated suppression of myocardial function, was also suggested. Even if in reviewing literature, it is relatively easy to find many cases of AFE, but no case of AFE affecting women with a history of severe congenital heart disease has been described. Despite the usual severity of this clinical condition, the outcome of AFE in our GUCH patient had a favorable course. A prompt diagnosis is fundamental for a good outcome but difficult to obtain due to the lack of a specific instrumental or laboratory test to confirm the diagnosis. In the majority of cases described in literature, the diagnosis was performed postmortem. However, to help in the diagnosis of AFE, the following criteria have been recently established: acute hypotension or cardiac arrest; acute hypoxia; and coagulopathy or severe clinical hemorrhage in the absence of other explanations, all occurring during labor, cesarean delivery, or in the immediate postpartum period with no other explanation for the clinical findings. In our case, beyond the presence of placental lacunar vascular spaces as risk factor and the clinical signs suggesting the hypothesis of AFE, cardiac imaging tools have been crucial in making a prompt recognition. TTE, in fact, revealed mildly dilated right chamber with severe pulmonary hypertension. 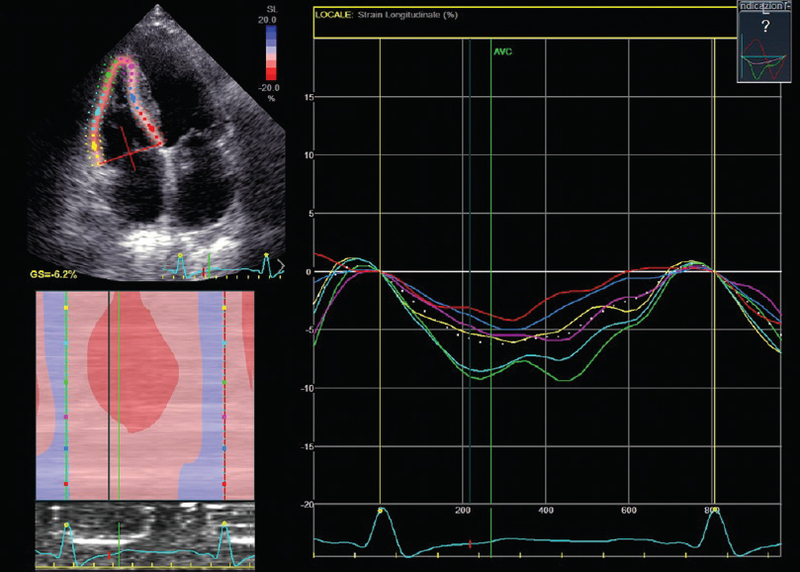 The evaluation of the tricuspid annular plane systolic excursion did not highlight a clear right ventricular dysfunction that was discovered by performing the more sensitive right ventricular free-wall longitudinal speckle-tracking strain. AFE causes intense pulmonary vasoconstriction and an acute pressure overload of RV, leading to dilatation. Hypotension results both from impaired filling of the left ventricle associated with pulmonary vasoconstriction and a systemic inflammatory syndrome. CT angiography, on the other hand, showed the absence of pulmonary vessel occlusion but the presence of ground-glass opacities similar to the early stage of ARDS, with a prominent hilar pulmonary vasculature. This diagnostic tool was essential in order to exclude other possible disorders and finally for exclusion, we made a diagnosis of AFE in this GUCH patient. More studies are required to assess the more specific and sensible diagnostic tests and the key factors for management and prognosis, especially in patients with a history of cardiovascular disease. The case report was presented as poster at the annual meeting of the Italian Society of Cardiology in December 2017. Clark SL, Hankins GD, Dudley DA, Dildy GA, Porter TF. Amniotic fluid embolism: Analysis of the national registry. Am J Obstet Gynecol 1995;172:1158-67. Meyer JR, Joseph E, Vladimir K. Amniotic pulmonary embolism. Braz Med 1926;2:301-3. Morgan M. Amniotic fluid embolism. Anaesthesia 1979;34:20-32. Clark SL, Romero R, Dildy GA, Callaghan WM, Smiley RM, Bracey AW, et al. Proposed diagnostic criteria for the case definition of amniotic fluid embolism in research studies. Am J Obstet Gynecol 2016;215:408-12.